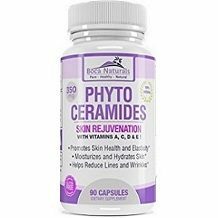 The focus of our review is Boca Naturals Phytoceramides. Phytoceramides are plant-derived compounds that can act on human skin cells to reverse skin aging. The manufacturer claims that this supplement will lessen your wrinkles, and frown lines, and help to promote firmer, healthier skin. Vitamin C is vital for producing the collagen that gives skin its firmness. Vitamin D is very necessary to replace old and dying skin cells. Vitamin E is an antioxidant that prevents excessive inflammation by removing harsh chemicals from skin cells. Vitamin A protects the skin from sun damage. Phytoceramides help to hydrate the skin and cause the release of collagen so that the skin firms up and looks younger and healthier. These capsules are vegetarian, and are free from fillers, binders and artificial ingredients, and are gluten free. Take one capsule daily a with an 8 oz glass of water. The manufacturer fails to specify whether the supplement should be taken with meals, nor if there is a preferred time of day to take it. Consult with your physician before beginning use of this supplement especially if you are pregnant, nursing, taking a medication, have an existing medical condition, or are aged under 18. The supplement is currently unavailable for purchase across the major third-party retail websites. At the time of this review, we were unable to determine the price of the supplement because no price information was available. The manufacturer offers a full satisfaction guarantee, but they do not state how long it is valid for, nor what condition the product should be returned in. It is unclear, for example, if you are able to return a used bottle of capsules for a refund or store credit. 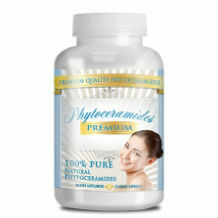 We liked a few things about Boca Naturals Phytoceramides supplement. It is made in a FDA registered state-of-the-art facility with strict adherence to Good Manufacturing Practices (GMP). All batches are 3rd party tested to guarantee the purity and quality of the ingredients. The capsules are vegetarian, and are free from fillers, binders and artificial ingredients, and gluten free. We do have some less positive comments however. This supplement is unavailable on the major third-party websites indicating that this is an unpopular product. We were not able to verify the cost of this supplement due to it being unavailable. There are no incentives for new customers, and no discounts for bulk buyers. The manufacturer offers a satisfaction guarantee, but does not state how long it is valid for, nor what condition the product should be returned in whether opened or unopened for example. When we took a look at the user reviews on Amazon, we saw that many people were disappointed with this supplement. Many said that they saw no definable benefits or differences to their skin after taking this supplement. We recommend that you only buy a supplement that has a clearly defined guarantee, and one that offers discounts for bulk buying, and has better dosage instructions.